What do you do if you’re a Job Centre manager and a benefit claimant who’s ripe for sanction turns up with someone else as their “representative”? If you’re in charge of Arbroath Job Centre, you have the man arrested, that’s what! Yes, you read that correctly. Tony Cox, an activist with the Scottish Unemployed Workers Network, had accompanied a female claimant who suffers from severe dyxlexia and reading problems. She was having several severe panic attacks every day, caused by the stress of filling five Universal Jobmatch applications every day. Cox was there to represent her. The jobcentre refused to consider reducing the numbers of applications she should make, and insisted that signing up to UJM is compulsory. It is not. Officials objected to Cox’s presence, and he was arrested when he left the building. He has been charged with “threatening behaviour, refusing to give his name and address and resisting arrest”. Don’t think he wouldn’t, either. Boycott Workfare wants us to get our retaliation in first – and has organised a day of action across the United Kingdom, to take place on Wednesday (February 25) – the same day Mr Cox will appear in court in Forfar to answer charges against him. About those charges: ‘Threatening behaviour’ is a catch-all offence in the Public Order Act that is often used by police to cart off people who are a nuisance to authority figures. Back in October 2012, this blog quoted a speech by Rowan Atkinson, calling for its reform. Well, this time it will have the opposite effect. People are red-hot with anger about this behaviour, arranged by cowards and bullies who think they can play God with people’s lives. 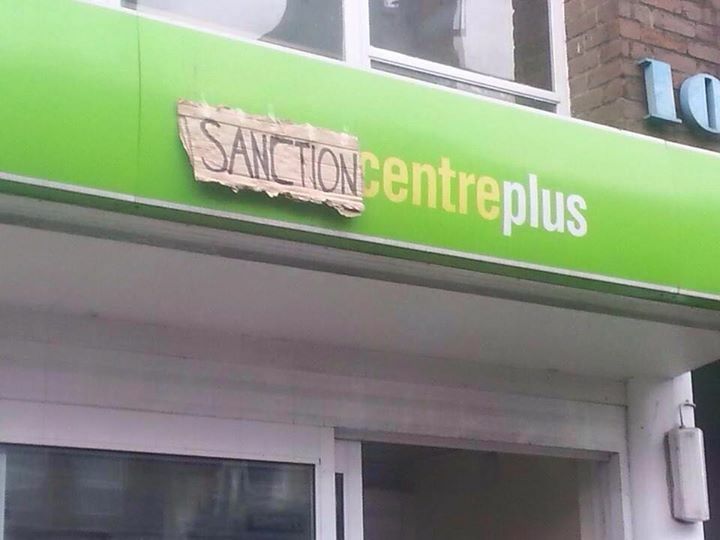 Boycott Workfare is urging everybody (who can manage it) “to descend on jobcentres round Britain to show their solidarity with Tony and distribute information to claimants urging them to exercise their right to be accompanied and represented at all benefits interviews”. So, please, print up some literature and turn up outside your local jobcentre to make your feelings known. calling people of good conscience to take action. I should like a definition of exactly what the DWP exists for please. Is it there to assist people in need or is it there to deprive people in need? I have several times in my life had to remind various government departments and also a tribunal, that is a basic human right and the law, that you can have “a friend” accompany you to ANY official interview, medical, disciplinary hearing, and similar. I await the above case getting to court with interest. Not once did the police even ask who I was. Yet JobCentre Plus has gone off on one, when they are in the wrong. I have also represented a number of people at JobCentre Plus benefit applications and when people have been refused benefit and never once had a problem. What status the citizens arrest – claimant on job centre staff given the accounts of what they get up to? If there are consequences to asserting your rights then you don’t really have rights. Through Skinner’s operant conditioning, we’ve learned to avoid these negative stimuli through compliance. What a cop is, is an agent of force, this is the only tool available to him so how can he be held accountable? The badge has become a shield, insulating the appointed defenders of the law from consequences. scrutiny or accountability to the lowly governed masses. It is a grant for special rights and privileges and any force used in its defence is justified and protected. I’ll be going along to the Job centre in Arbroath as I live there. The people in that job centre are quite nice really, it’s the new overall boss – she’s an Esther McVey, except she’s Scottish! Wonder just how many people will turn up to protest at the job centres around the UK? Not many methinks as yet again, people are too bone idle and couldn’t give a toss about anything except themselves! The way things are going on, the way people are still sitting on their erses, I can visualize another Tory government in May! Should be interesting to see how many people turn up??? how about he sues the job center for libel. If three people turn up at my local Sanction Center just to protest (it likely won’t be as many as that), they will be ignored, but also how will they know they are there for the same thing? Must they ask total strangers why they are there to find each other?! It may be good to do so in order to connect with others, but would definitely require a confident person to talk to strangers, not the likely demoralised an depressed persona of those most affected by the sanctions. Perhaps you’ve never been to one of these events. People tend to be extremely well-organised, with placards to wave and leaflets to hand out to those going in – and yes, they do ask total strangers why they are there. From what I have found, protest inside the Sanction Centre and the security personnel will force you outside, I find most who are outside are smoking and drinking and appear almost anti-social (they may be quite friendly), everyone else is either inside or getting away from the place as fast as possible. There’s no need to go inside. I suggest you go along to your nearest Job Centre Plus on Wednesday and see what transpires, rather than speculating about it negatively.